Daiwa’s redesigned their smooth Sealine-X reels, adding a dual-position power handle and replacing the original bearings with three stainless steel, super corrosion-resistant ball bearings. Super Speed Shaft design totally disengages the spool from the drive train for longer casts with lighter baits. Sealed X-Treme Drag Performance and massive marine bronze and stainless steel gearing take over after the hookup. Large-capacity spool and two gear ratios—4.9:1 or 6.1:1—to choose from. "I have been using the Sealine 40 for about a year now and it is great! I have gone from pier to boat and now kayak. 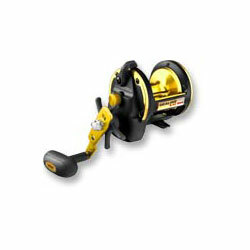 I have used this reel for bottom fishing to shark fishing off the pier and it handles it with ease." "I own an x-30sha and it is one fine reel. It casts like just as good as any long casting reel out there. smooth as silk and tough to birds nest. Am looking forward to showing people on piers and in boats what this reel can do from the beach when I get into kings or cobia this summer. LOVE THIS REEL."